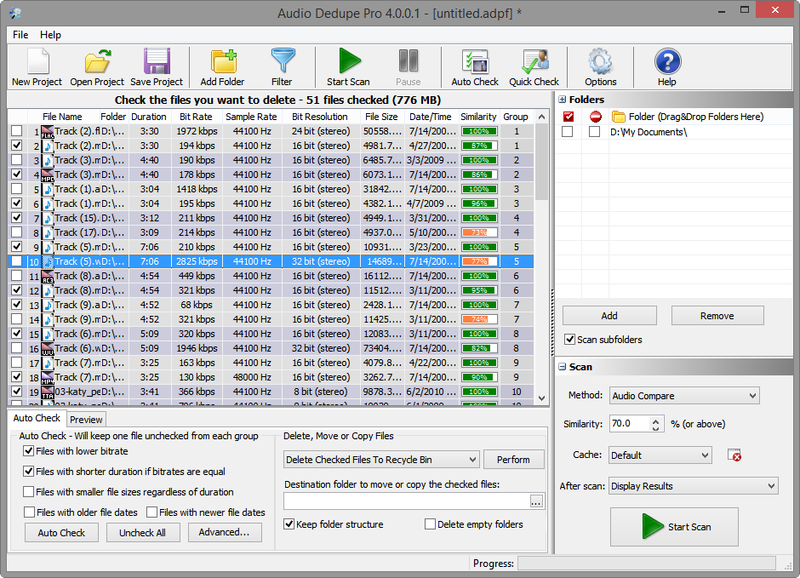 This version of the fastest and the most precise duplicate file finder includes a large number of major improvements and new features. The Multi-Language (Unicode) support, Microsoft Excel (XLS) and Word (DOC) files preview support, improved sort in the results list, optimized performance for the delete and move operations, additional options while searching for similar and duplicate file names are just a few to name in the list. This new release is based on a completely new platform and will provide the foundations for the development of even more fancy new features. While Fast Duplicate File Finder could scan files named in any character set (Language) it could scan only two languages simultaneously. The default one in your system and the one set for non-unicode applications. While this is not an issue for most of the users now this limitation no longer exists. The application is capable of listing results in any alphabet simultaneously. For example you can have files in Chinese, Greek or Arabic language listed in the results at the same time. There is a support for XLS and DOC files right inside the Duplicate File Finder’s preview window. This feature requires the corresponding Microsoft Word and Excel applications to be installed on the computer. As loading large doc and xls files can take several seconds ( this is something that depends on the installed Word and Excel applications ) there is an option to disable the preview for them in settings. The “Exclude From Self Scan” and “Disable auto-check for this folder” items are now listed as check-boxes inside the folders list. That helps to easier visualize the configuration of the current project. The two features are handy when one needs to merge two or more folders and set one or more of them as “Source”. The “Exclude From Self Scan” option denotes that the files inside that folder will not be compared with each other. They will be compared only with the file in the rest of the folders that are added in the project. The “Disable auto-check for this folder” is pretty self-explanatory – if the auto-check feature is used the items in the folder will not be marked. Sorting duplicate files in past versions was performed inside the groups in order not to break the group integrity. It would not make any sense to have the files sorted by size and have files from different groups listed together. The new improved sort will sort the items inside the groups as in past versions and also sort all groups keeping the items inside together. Now if you sort the items by size in descending order the groups that contain the largest items will be listed firs. The “Similar File Names” search mode now includes an option “Do not compare file extensions”. This tells the application to compare only the file names without their extension. This is handy in order to find duplicate files like “Beat It.mp3”, “Beat It.wav”, “Beat It.ogg” or “Wedding.avi”, “Wedding.mp4”, “Wedding.mkv” and so on. 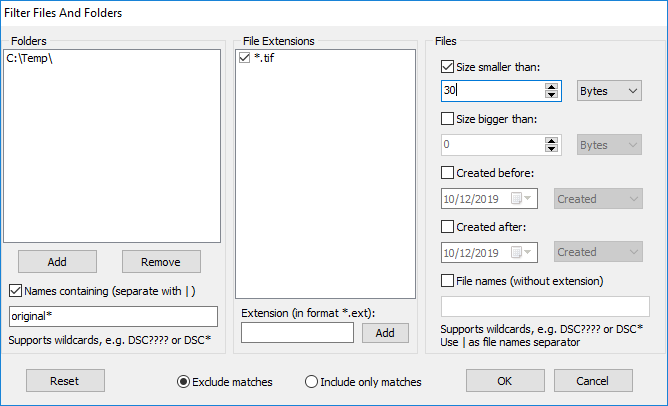 An extremely handy feature that can find multiple versions of the same file that are converted to different file formats. These include faster delete/move operations on large amount of files. Improved scan speed for folders that contain large number of files. The information panel above the results grid is now updated after every delete or move operation. There are a lot of other small GUI fixes and enhancements that are not worth mentioning. Do you need a feature? Did we miss a bug? Please drop a comment below! We will be glad to hear from you! This entry was posted in Fast Duplicate File Finder and tagged Best Duplicate File Finder 2014, Best Duplicate File Finder Lifehacker, Best Duplicate File Finder Review, Best Duplicate File Finder Software, Best Duplicate File Finder Vista, Best Duplicate File Finder Windows 7, Duplicate Finder, Find Duplicate Word Documents, Find Duplicate Word Files, Find Duplicates, Find Similar Files, Free Duplicate File Finder Download, Free Duplicate File Finder Vista, Free Duplicate File Finder Windows 7 64 Bit, Free Duplicate Finder, Free Duplicate MP3 File Finder, Free Duplicate Music Finder, Free Duplicate Photo Finder, Freeware Duplicate File Finder Windows, Freeware Duplicate File Finder Windows 7, Freeware Duplicate Image Finder, Freeware Duplicate Mp3 Finder, Freeware Duplicate Picture Finder, Open Source Duplicate File Finder, Remove Duplicate Word Documents, Shareware Duplicate File Finder on March 4, 2014 by MindGems Support.